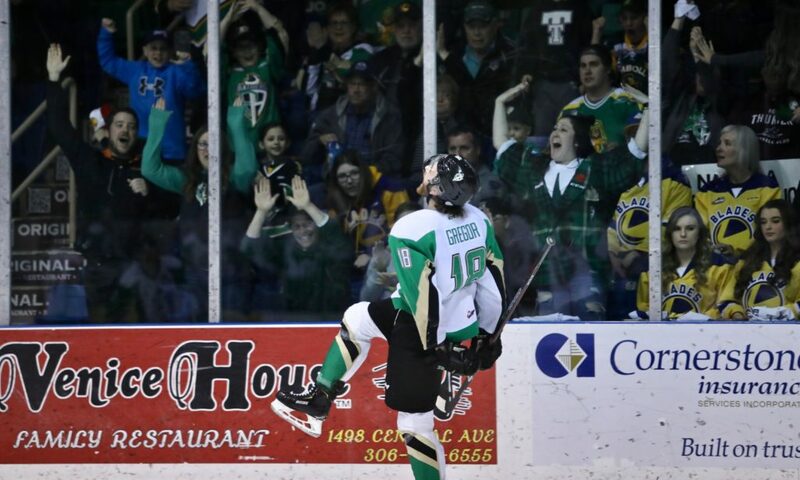 Prince Albert, SK – Noah Gregor and Dante Hannoun each had two goals and an assist to lead the Prince Albert Raiders to a 6-1 win over the Saskatoon Blades in Game 5 of their Round 2 series on Friday night at the Art Hauser Centre. The Raiders lead the best-of-seven series three games to two. Hannoun is now tied for the team lead in goals during the 2019 WHL Playoffs, while also leading the team in points. Gregor and Brett Leason, who had three assists on Friday night, are tied for second with 10 points. The Raiders had chances to open the scoring throughout the first period. Gregor sent his attempt from a tic-tac-toe passing play through the crease. Leason also had his backdoor one-timer stopped by Nolan Maier. The Blades’ best chance of the period came when Ryan Hughes put a shot on goal. Kirby Dach picked up the rebound, pivoted to the near post, but was unable to jam his attempt past Ian Scott’s pad. In the second, the Raiders broke through on the power play. Hannoun’s point shot found its way through traffic and past Maier 2:51 into the middle period for his fifth of the playoffs. Less than five minutes later, Gregor extended the lead. The San Jose Sharks prospect intercepted a cross-ice pass to put himself on a shorthanded breakaway. Gregor made a quick move to his forehand and snapped a shot past Maier for his fourth of the post-season 6:01 into middle period. The Blades got one back 9:07 into the period. On a delayed penalty, Emil Malysjev stepped in from the point and beat Scott with a slapshot from the top of the faceoff circle for his first goal of the WHL Playoffs. About a minute later, Gregor restored the Raiders’ two-goal lead. Hannoun dug the puck off the wall for Gregor. The overager gained speed through the neutral zone, turned the corner on Malysjev, reached around Maier and stuffed the puck in far side for his second of the contest. The Raiders kept the offence coming in the third period. Just 61 seconds into the final frame, Leason found a trailing Aliaksei Protas and the Belarusian import beat Maier over his glove hand for his third goal of the post-season. Midway through the third, Hannoun tallied of his second of the game. The overager from Delta, BC redirected Brayden Pachal’s shot past Maier with 7:29 to play. About 90 seconds later, Sean Montgomery wrapped up the scoring. He collected a pass in the slot and fired a shot past Maier for his sixth goal of the playoffs, which ties him for the team lead with Hannoun. Scott finished the game with 26 saves to pick up his 10th career win in the WHL Playoffs. Maier made 19 saves in a losing effort before being pulled with 6:06 remaining. Koen MacInnes didn’t face a shot in his time in the Blades’ goal. The series returns to Saskatoon on Sunday afternoon for Game 6 at SaskTel Centre with a chance for the Raiders to clinch a berth in the Eastern Conference Final. Puck drop in Saskatoon is 4 p.m. If necessary, a deciding Game 7 will be played on Tuesday night at the Art Hauser Centre. Game time on Tuesday is 7 p.m. If needed, tickets will go on sale on Monday morning at 9 a.m. with a limit of six tickets per patron. Online ticket sales will begin at 10 a.m.